Here at Little Dress Up Shop we only sell dress ups we would buy for our own children. In fact all of our dress ups have been tested out on our little ones. If they don't love it, we won't sell it. Trusted by over 145,000 Moms and the positive reviews they send us on the products they buy! Your kids will love the comfort of our Dress Ups. The fabrics are so soft! We sell nothing with itchy fabrics or underskirts. We carry only high quality Dress Ups that last. They are made to be durable. In fact, we guarantee their quality and durability. They are washable, as opposed to some costumes found in big box stores which you can only "wipe clean." Our products are easy for children to put on and take off. There are no buttons or ties to frustrate little fingers. Most dresses stretch to fit over their heads like a shirt. There is nothing more to do! Our Dress Ups are available in multiple sizes to assure your kids get just the right fit. No more "too small" dress-ups. Amazing customer service (we're easily reached and your always right). 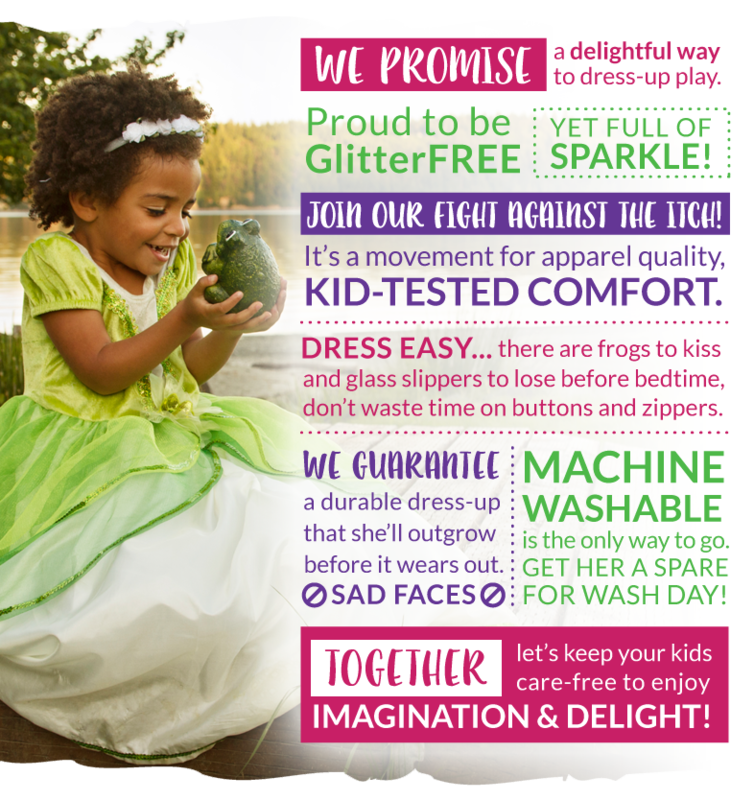 Washable dress-ups (in an actual washing machine). Always FREE Shipping (this has been a tricky one to keep around with all the shipping price hikes). Durability…dress-ups made to play in (why isn't this a given?). By now we feel like we've set the bar pretty high….our way to ensure delightful play. We are committed to offering THE Best customer service and community service possible. We love talking to you and it makes our day each time we get your lovely comments and reviews! Our personal Customer Service cannot be beat with our 100% Satisfaction Guarantee. Toll free phone number gives you peace of mind that you can reach us with any questions or concerns. And we always answer our e-mails! Quick processing times. All items are in stock when shown as "available" online and we ship orders the same day when placed by 2pm Eastern. FREE Shipping for all orders - we don't require a minimum either (for US addresses only). Returns and exchanges are simple. Just use our Return Authorization form or call for help. (generally no time frame cutoffs). Service also to charitable organizations-giving to children in the community and around the world. "I'd buy from your company just so that I could have the pleasure of dealing with your excellent customer service!" -J.D.